Xinjiang province, the westernmost region of the China, was once the main roadway of the ancient Silk Road. It was also along this route that the Islam came into China. Until today, Xinjiang is still prominent for its Islamic identity in the country. When Muslims came to Xinjiang in the 10th century, they brought with them strong Islamic influences. Most of them are Turkic-speaking Muslim Uyghur minority and Islam is an integral part of their life. Most notably, the Uyghur are almost exclusively located in the Xinjiang area. Over ninety-nine percent of them live in Xinjiang. Muslims in Xinjiang preserved strong Islamic characteristics and greatly enriched Chinese Islamic culture. You'll be mesmerized by the rich Islamic history and culture in Xinjiang. The Uyghurs celebrate the Lesser Bairam and Eid al-Adha, which are two the biggest Islamic festivals. During the month prior to Lesser Bairam, Muslims fast from dawn to dusk. Muslims celebrate Lesser Bairam to mark the end of the 30 day fasting during the month of Ramadan. On the day of Lesser Bairam, thousands of Muslims in Xinjiang gather on the square in front of the Id Kah mosque, located in the center of Kashgar, to celebrate the festivals as a triumph. On those days Uyghur people dressed in their best attire, and together they dance their "Sama” folk dance with great joy and enthusiasm. The Eid al-Adha can be considered as the biggest annual Islamic celebration in XInjiang. Families would sacrifice domestic animals to commemorate the sacrifices made by prophet Ibrahim. On the morning of Eid al-Adha, Muslims begin the festival with a morning prayer at the mosque and socialize. In Xinjiang, the festival lasts for three days and activities like horse racing, wrestling and dancing are common ways of celebration. The Uyghurs also visit each other's homes, where guests are offered fried twisted noodles and other special foods. 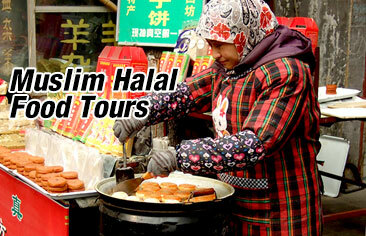 Xinjiang also presents a good example of the fusion of Islamic food culture. The cooking styles of Xinjiang's Muslim cuisine are representative of the Islamic influence on the ethnic groups living in the Xinjiang region of China, in particular that of the Uyghurs. Xinjiang cuisine is remarkably well known and is probably one of the best part of traveling to Xinjiang. Signature ingredients include roasted mutton, kebabs, roasted fish, and rice. Walk through any of the city in Xinjiang and you will find its own ethnic cuisine such as the Snack Street of Hui Ethnic Group in Changji, the Kazakh flavor snack in Ili and Altay, and the Uyghur style food in Kashgar and Hotan. Today, Xinjiang has over 20,000 mosques, 10 times as many as it had over three decades ago. It is sign of a strong Islamic cultural link and presence in the province. For instance, Uyghur mosques reflect the Islamic architecture of Central Asia. Xinjiang province’s grandest ancient mosques represent this style, such as the fifteenth-century Id Kah Mosque in Kashgar and the eighteenth-century Emin Minaret Mosque in Turpan. Tall, slim, cylindrical minarets and ogival domes set these mosques apart from the surrounding landscape.